To educate the community on how to build organic sustainable food systems, to provide fresh organic produce to needy families and to beautify our community through gardening. Forest Park Community Garden (FPCG) was started by two local gardeners, Jessica Rinks and Gina Thomas, in the summer of 2009. The hope was to create a space so that people in and around Forest Park who had insufficient acces to land on which to garden could do so, to educate the community on sustainable food systems and to help supply area food pantries with fresh produce. In its first year 15 raised beds were built, 12 of which were rented to residents in the community. The 3 remaining beds were planted and maintained by volunteers who harvested the food grown in the beds and donated it to the local food pantry. The first year at the garden there was no water source and patrons had to water their plants using what they could carry from home. In 2010 we built 15 more beds - for a total of 30 garden plots - and were lucky to have 10 rain barrels donated which were filled by the fire department each week. Having a solution for water helped us keep the plots rented but because the space was unsecure we experienced a fair amount of theft of vegetables that year. There was also no space to store tools which meant gardeners had to lug all their tools back and forth every trip. As an organization we explored options for improving security and providing storage but because our only revenue was the small plot rental fees we charge residents along with minor fundraisers like plant and bake sales, our options were very limited. In November of 2010 we were asked by the Village of Forest Park to partner with them in applying for a Model Communities grant aimed at implementing programs to help improve the health of residents. This was an exciting opportunity for FPCG since it would help advance our mission of teaching the community how to build organic sustainable food systems while partnering with our local government. 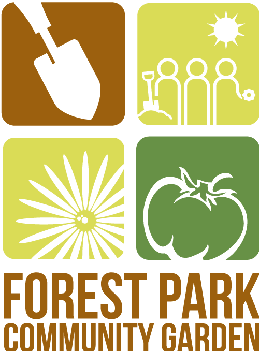 In early 2011 we learned that the Village of Forest Park had been awarded the grant that would offer us the resources to expand FPCG in a manner that was consistent with our original vision. Still, though we had some funds available for supplies, we were struggling to find a way to get the work done without exhausting all the grant money in labor costs. In the spring of 2011 Comcast contacted the Village of Forest Park to ask if there were any opportunities for their annual Comcast Cares volunteer day. They preferred something outside and would love it if it were gardening related. Unbelievable. On Saturday April 30th, 2011 Forest Park residents, FPCG gardeners, Village employees and elected officials joined Comcast volunteers and together transformed what was a nearly vacant lot into a vibrant and thriving garden. Our garden grew by 21 new raised beds, 3 new accessible beds, a flower shaped "Giving Garden" that is accessible to the entire community to harvest from, a beautiful flagstone path leading to the Giving Garden. The Giving Garden will also be used as a teaching garden and to grow fresh food for the local food pantry. In addition to creating space for people to grow edibles, we also planted hundreds of native plants which will draw pollinators, butterflies, and birds to our garden and used as demonstration gardens for an education program we are also planning to develop to teach our community about the importance of native plants.